The defense has been much maligned this year and much of it deserved. The first two games (v New Orleans and v Atlanta) set an initial impression of the defense as not just bad, but historically bad. Failing on multiple fronts and giving up yards and points in nearly every conceivable way. Slowly, but surely, Ken Norton Jr and Jack Del Rio were getting these players together. They have been making progress, but it’s been hard to see. That’s because they still had occasional mistakes that led to big plays and that gives this impression that the defense is problematic all over, when in reality the problems are getting smaller and more specific. In week 12 against Carolina, this Defense–that was on pace to set records in yards allowed–came out and played their best half of football yet, especially in coverage. 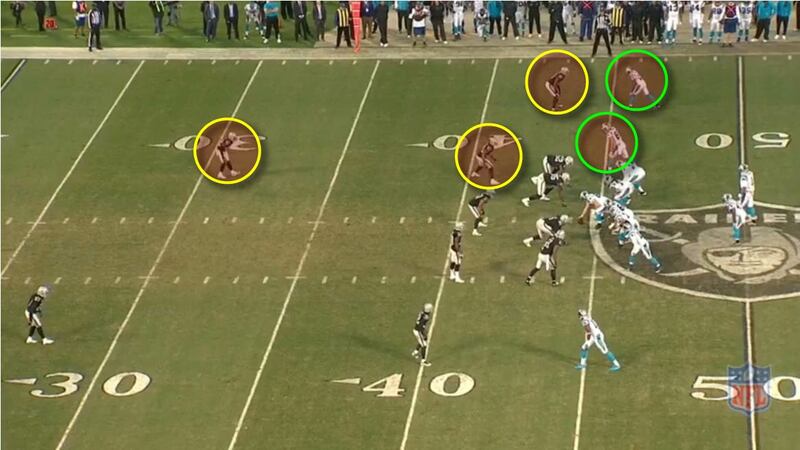 They held Cam Newton to 3/12 (25%) for a meager 18 yards. 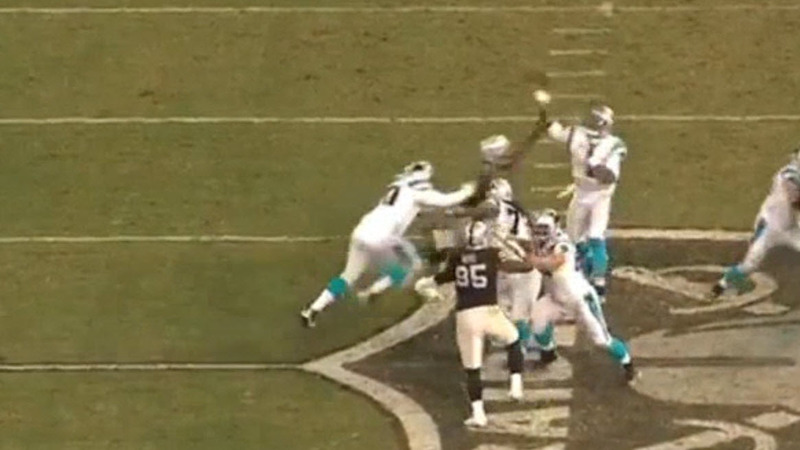 A 6-yard Bruce Irvin sack means that the Panthers had 12 Net passing yards for the half. In addition, the Raiders’ defense matched the Panthers offense in the scoring column, 7 points apiece. That’s a hell of a half of defensive football for any team, much less for a defense that started this season off so poorly. Unfortunately, it would not last; the third quarter came and disaster struck. The Panthers were able to take advantage of 2 short fields (30 yards and 28 yards) on Derek Carr turnovers and converted them both for touchdowns. Adding to that were two big play drives that accounted for 25 unanswered points. In the 4th Quarter, Super Carr came out and led the offense to 11 4th quarter points to take the lead 35-32. And then with 1:45 remaining in the game and one timeout, the Panthers took the ball at their own 25 yard line. It was up to this up-and-down defense to take the field and close out the game. Raiders’ fans everywhere left with the image of the Mack sack burned into their memories. 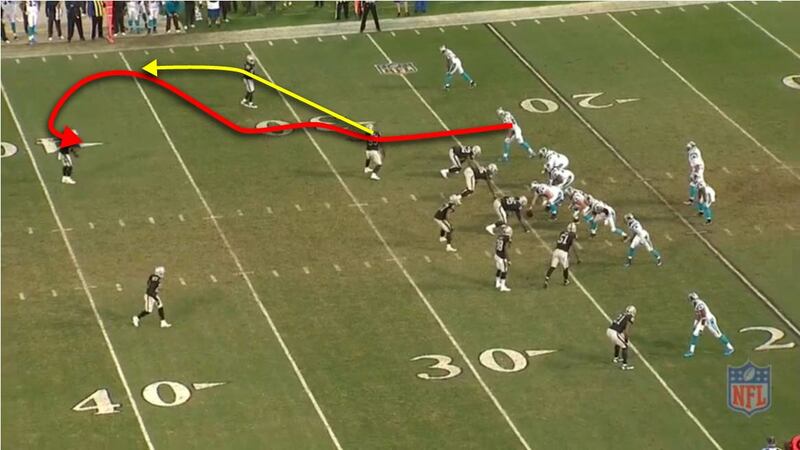 But the Panthers’ final drive was more than just that one play; it was 6 plays. Here’s a look at how the entire defense performed on that final drive. Interesting note : Antonio Hamilton is playing the Left cornerback position on this play. David Amerson was inactive this game due to injury and DJ Hayden was injured in-game. This put the undrafted rookie into the game. LB Malcolm Smith is trying to communicate to Safety Karl Joseph. It appears that Malcolm expects to have specific help to set up bracket coverage on TE Greg Olsen. 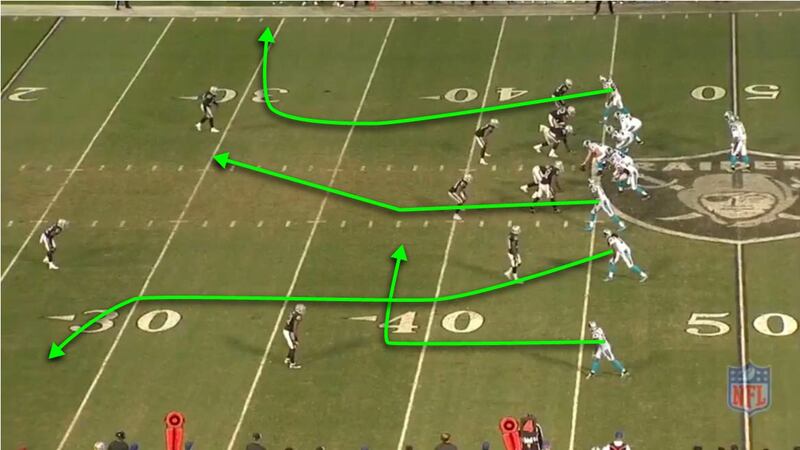 Greg Olsen runs an intermediate out route and then breaks back inside. Malcolm Smith undercuts Olsen’s route to the outside and plays it almost like zone coverage, overplaying the underneath and outside. He is either mistaken for the coverage or he’s expecting Karl Joseph to give over-the-top help to the inside. 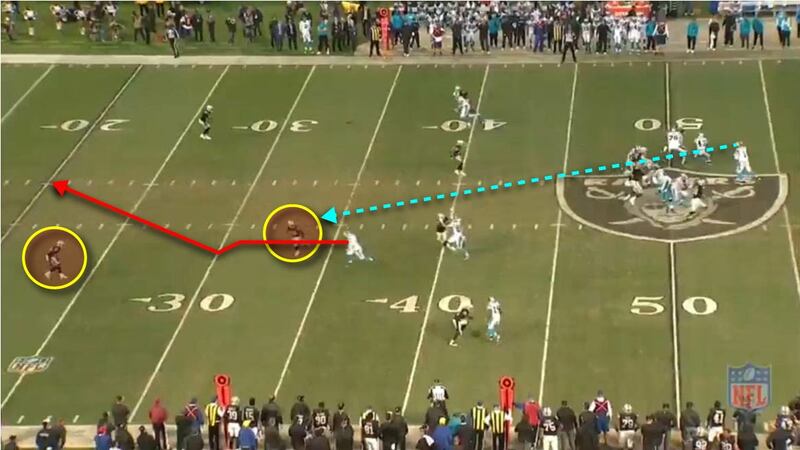 See Malcolm Smith has the Olsen covered on the outside breaking route. Karl Joseph see the outside receiver Ted Ginn running a sideline fade. Karl has to take that route and so he drops back and towards the sideline. At this time, Antonio Hamilton will drop off his coverage of Ted Ginn. 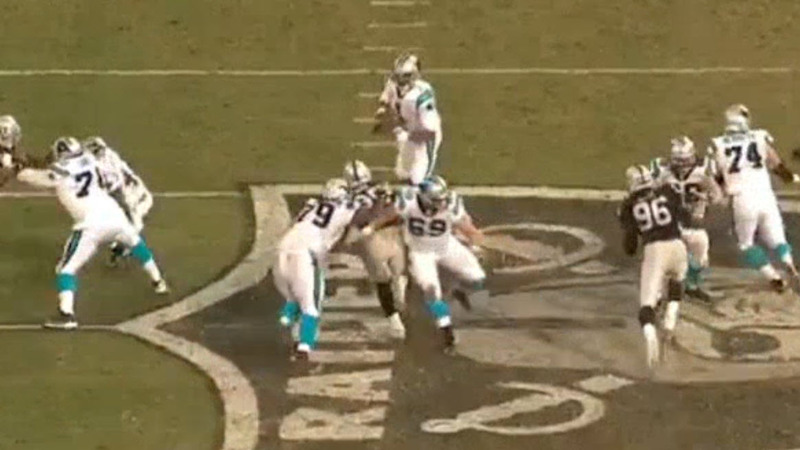 He trails Ginn, but is also checking back to the QB to see if he can give help to Olsen on the outside. The trio of Karl, Malcolm, and Antonio need to somehow get someone on Ginn deep and bracket Olsen. The way it works out, Karl has Ginn deep and so Malcolm and Antonio are bracketing Olsen. But since they are both to the sideline, it’s like having no “bra” and two “ckets” which does not make for a good “bracket”. On this play, Cory James has the RB in coverage and when James reads the RB in pass pro, James rushes up the middle. By blitzing it leaves some gaps in the field. 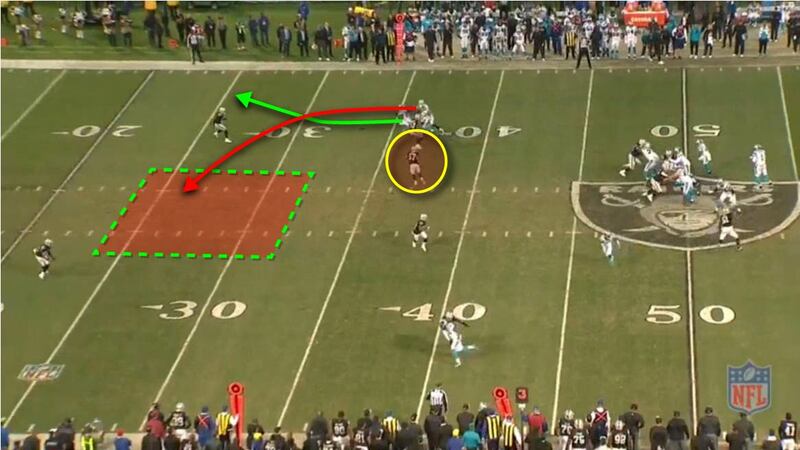 If the RB is checking and then releasing, the RB is left uncovered. There’s a huge gap in the middle of the field that Greg Olsen will be able to exploit. A LB dropping back and getting depth into that gap would force Cam Newton to make a more difficult throw over the LB and into a smaller window. Keep this in mind as it occurs later. The RB is indeed check-releasing and is now absolutely uncovered in the flat. It is perhaps fortunate that Newton does not recognize the Green Dog, because the sideline is clear and it may have put the RB with a 1-on-1 with Reggie Nelson. Cam Newton has a clear viewing and passing lane and makes the throw to Greg Olsen for a quick and easy 20 yards. This was not a Prevent. It was not a “soft zone” either. 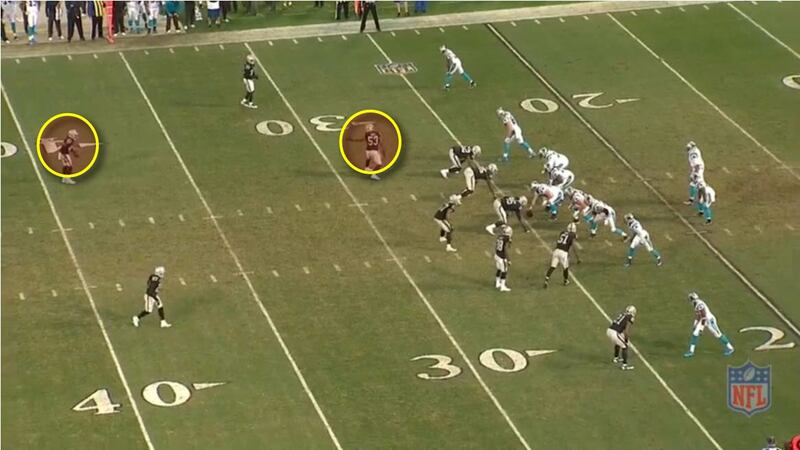 It was man coverage and there was a blitzer, but it gave Greg Olsen a chance to get 1-on-1 and he eats it up. That’s a lesson for Ken Norton Jr. Play 2 : 1-10-CAR 45 (1:20) (No Huddle, Shotgun) C.Newton pass short right to D.Funchess pushed ob at OAK 44 for 11 yards (S.Smith). 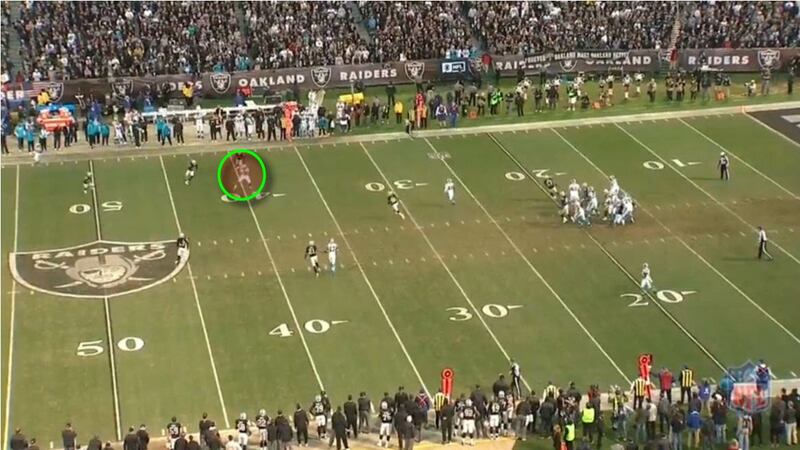 Note : Sean Smith switches sides to the left cornerback position. Reggie Nelson and Karl Joseph switch sides as well. Sean Smith and Reggie Nelson are set to double Devin Funchess. 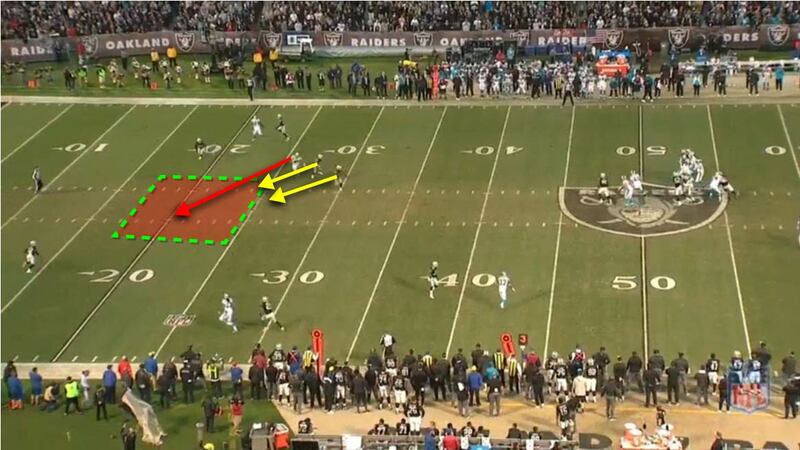 They are expecting a deep route and playing inside-outside bracket with Sean Smith playing in off coverage. With 1:20 remaining in the game, they are allowing an underneath completion. With Cory James rushing the passer on the Green Dog, there is no underneath help at all, leaving an easy viewing and throwing lane. Note : In the middle of the field, Malcolm Smith has Greg Olsen well covered and also has over-the-top help from Karl Joseph. Funchess makes the catch and then gets out of bounds, using up only 5 seconds to get 10 yards. Again, the Green Dog and the sinking coverage allowed for too much space and gave Cam Newton an easy throw, which he converted. 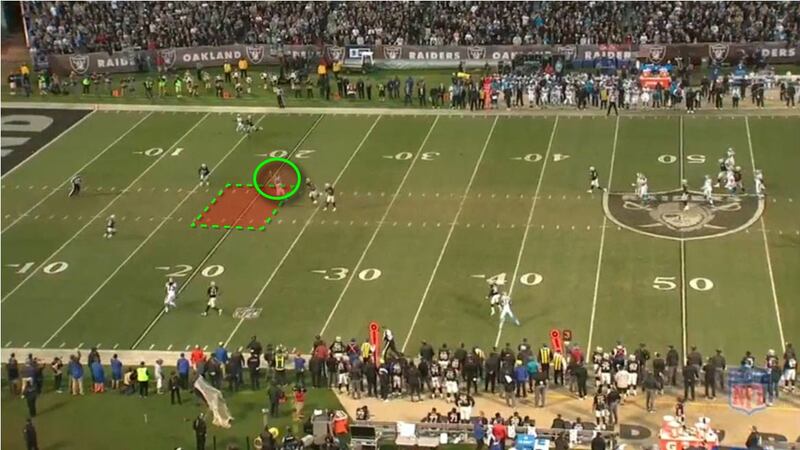 This is another lesson for Ken Norton and he adjusts in the next play. 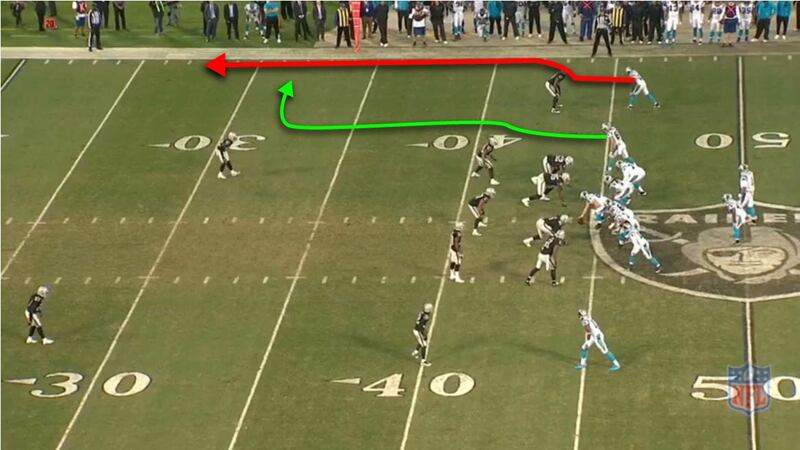 Play 3 : 1-10-OAK 44 (1:15) (No Huddle, Shotgun) C.Newton pass incomplete short right to T.Ginn [K.Mack]. Note : Same play as in Play #1, but execution is very different. Note : The RB stays in to block, but this time Cory James does not rush and instead stays in the middle zone coverage. Same route combination as in Play #1. 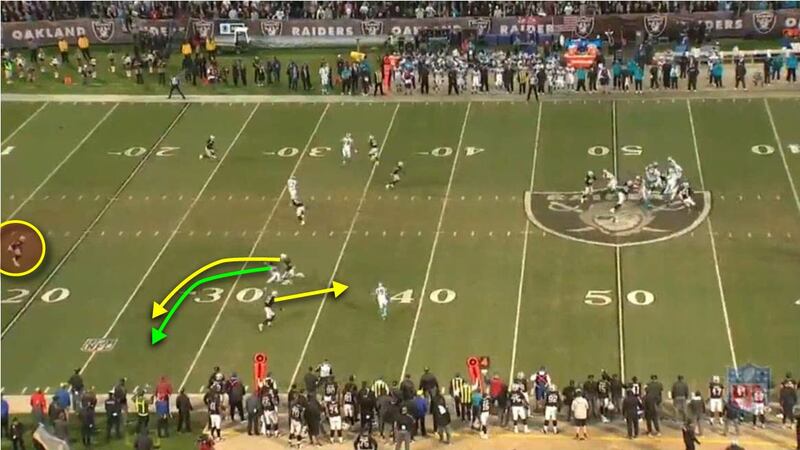 Ginn runs a fade and Olsen runs the intermediate out breaking route. 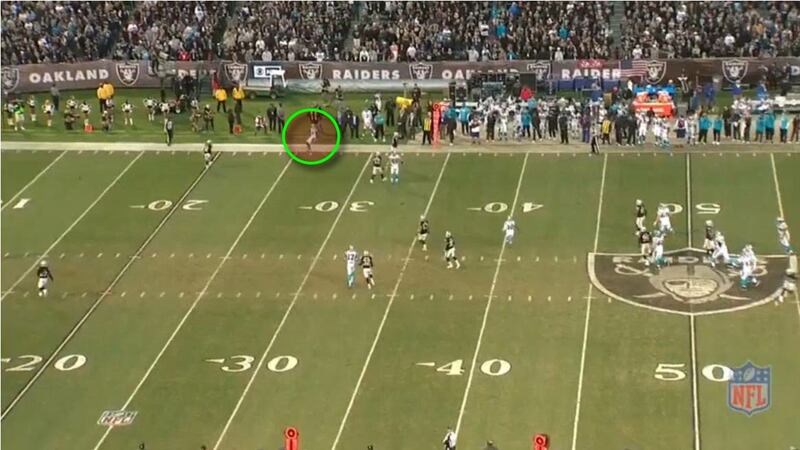 This time, though, Ginn will be the target. 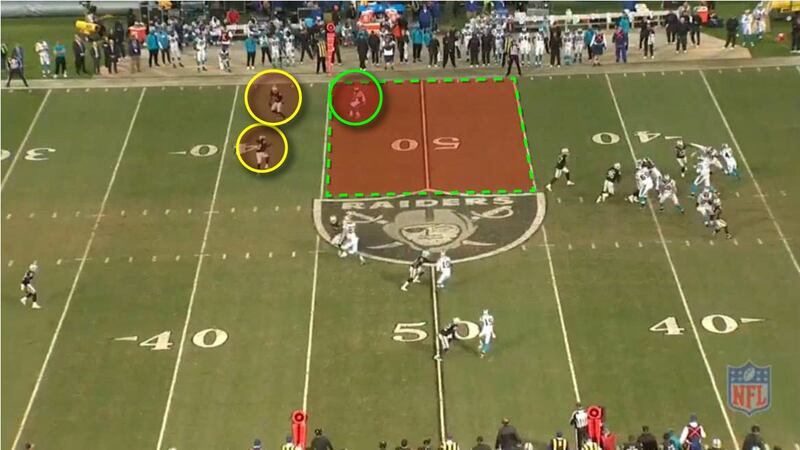 Smith has man coverage on Ginn and Malcolm Smith is covering Olsen. Karl Joseph has over-the-top coverage. 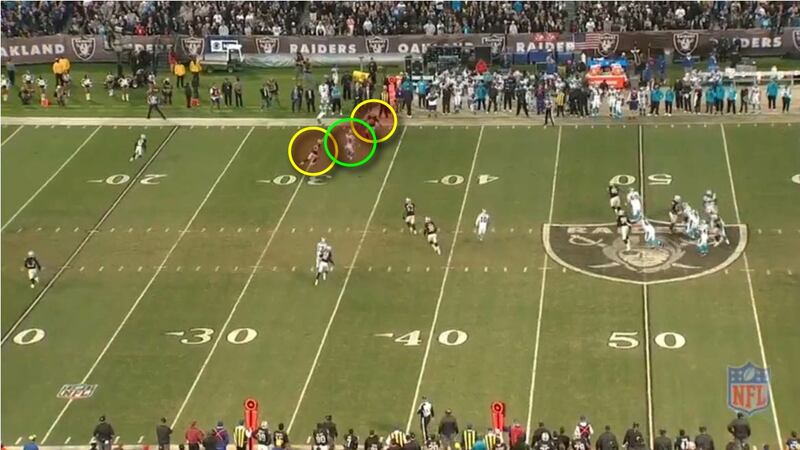 Notice the difference between Malcolm Smith’s coverage in this play and in #1. Here, instead of undercutting the route, he’s over playing the inside and vertical route. He knows he has help to the outside. Cam Newton knows that Sean Smith will drop coverage to pick up the outside bracket on Greg Olsen. 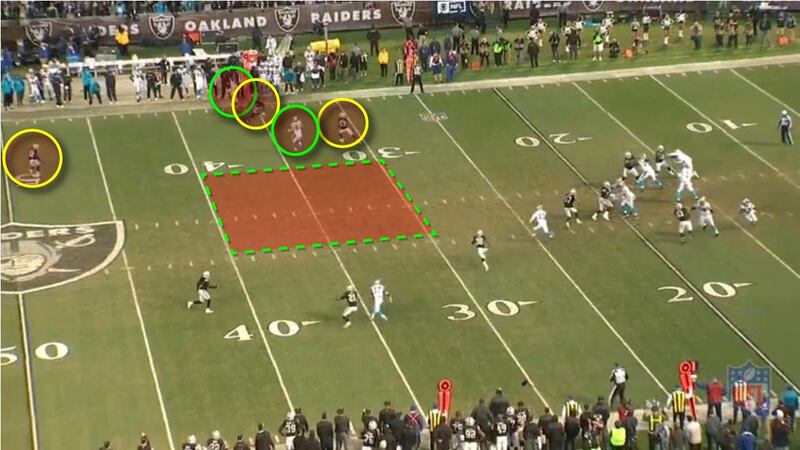 This takes away Olsen (as the Raiders have done most of the game), but it gives Cam a small window to get to Ginn. Newton has to make a precision throw over Malcolm Smith and under Karl Joseph and right at the sideline. As expected, Smith hands off Ginn to Karl and we see how this brackets Greg Olsen. Notice the gap right behind them and in front of Karl. And it goes out of bounds. Because Khalil Mack hits Newton’s arm. 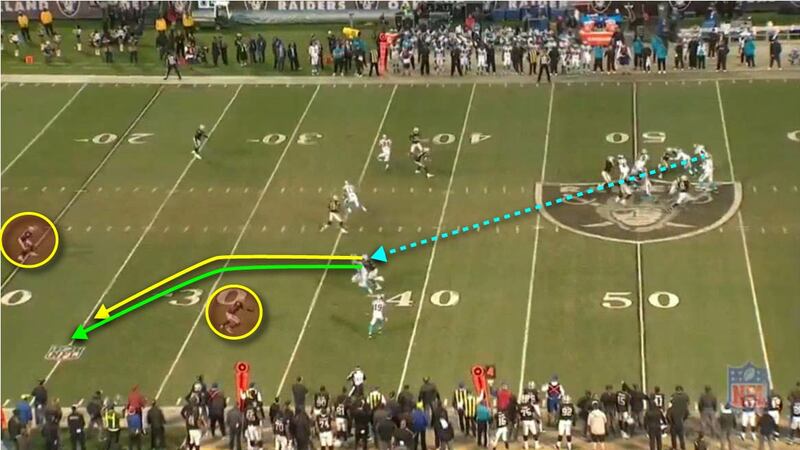 Mack gets to Cam in 2.5s and disrupts the throw. Otherwise, Cam would have had a chance to try to convert on that difficult, high-precision throw (and Karl Joseph would have had a chance to make a pass break up). No Green Dog and properly handled bracket on Greg Olsen. The coverage was good and the pass rush even better. Play 4 : 2-10-OAK 44 (1:10) (Shotgun) C.Newton pass incomplete short right [B.Irvin]. 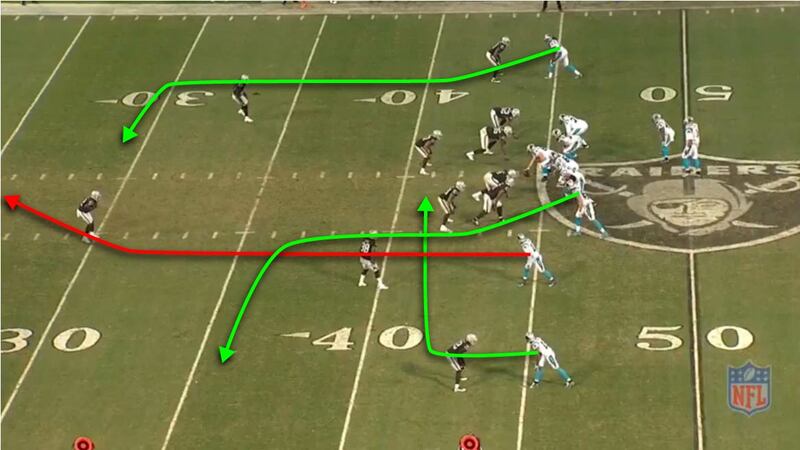 Note : WR Philly Brown runs the same deep post route on TJ Carrie that Ted Ginn scored his 88 yard TD on and has a similar result. Note : Thank you, Jihad Ward for the disruption at 1.8s seconds or else this play may have gone for a TD. Again, the RB will stay in to block. Cory James does not Green Dog, but instead gets good depth to give Sean Smith some underneath, interior help against Kelvin Benjamin. Cam Newton wants Philly Brown. He sees Carrie turning the wrong way to protect against the deep post. Newton needs about another 0.2 – 0.4 seconds to make the throw for the potential game-winning touchdown. Brown makes a hard post move and beats Carrie. As TJ tries to flip his hips and catch up, he falls down. There’s space between the two safeties. It is a bit exaggerated at this point because Cam Newton has been flushed from the pocket and Reggie Nelson is now flowing towards the scramble. This is why great interior pass rush is so important. It takes Mack about 2.7 – 3.2 seconds in most situations to get home, but if someone (ahem Mario ahem) can win quickly inside, it can affect the QB in around 2.0 seconds. In this case, Jihad Ward exploded inside to get Cam Newton to drop his eyes at 1.8 seconds. This could very well have saved the game. Play 5 : 3-10-OAK 44 (1:05) (Shotgun) C.Newton pass incomplete deep middle to G.Olsen. Double Tight Ends both standing up to the right. Greg Olsen to the outside and Ed Dickson to the inside. 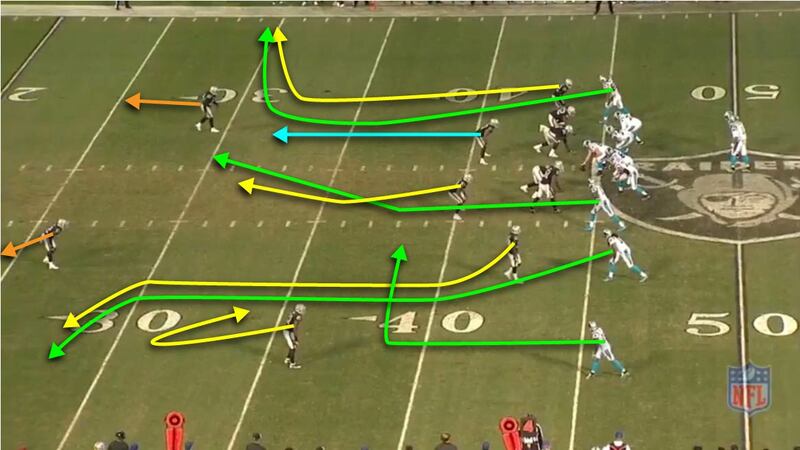 Devin Funchess tight to the formation on the left and Kelvin Benjamin split wide left. Outside routes against Man Coverage pull the defenders out of the middle. The outside deep routes that release to the sideline pull the safeties towards the sidelines, leaving the middle open. Malcolm Smith has Greg Olsen while CB Sean Smith has Ed Dickson. 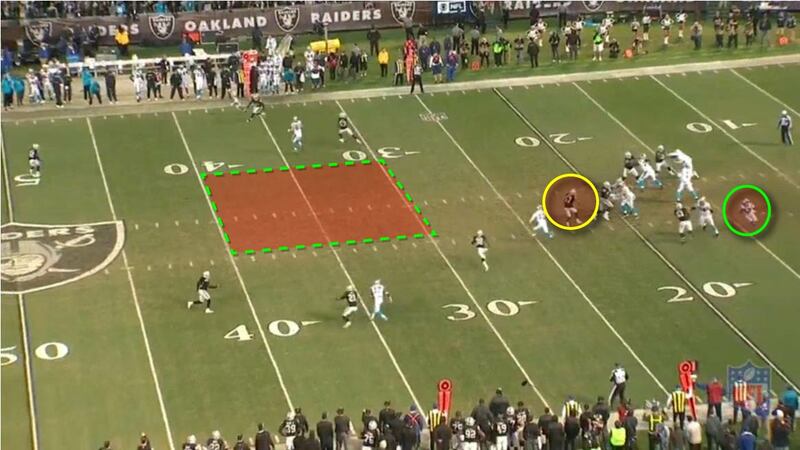 Cory James (blue) drops in coverage and gets depth to help against Greg Olsen. 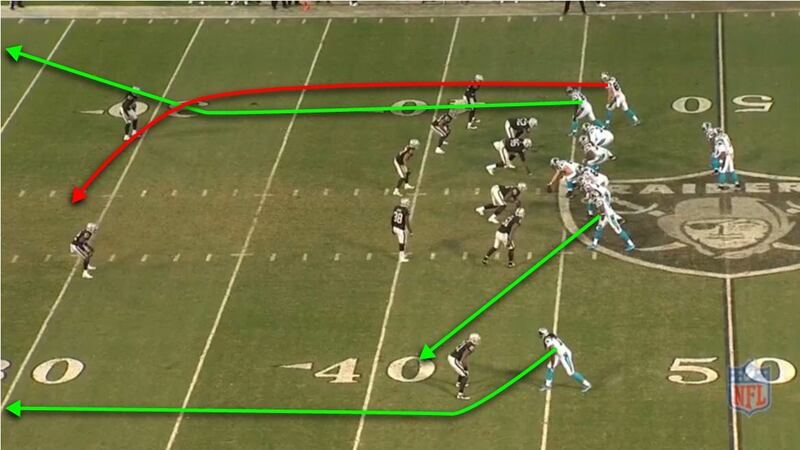 Similar to Scissor route where the receivers’ routes cross, but here Greg Olsen’s route crosses into the middle of the field. Key to defending Olsen is Cory James. 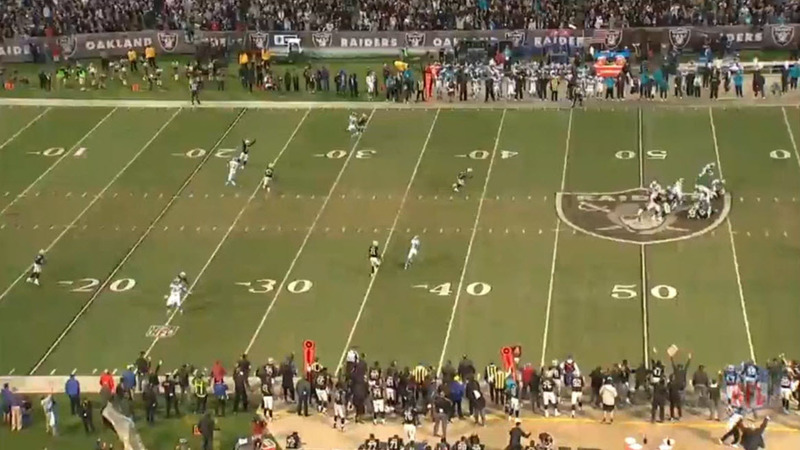 James will not get quite enough depth nor enough width and ends up too close to Malcolm Smith. Ideally, the defenders would have some kind of bracketing where defenders are on either side of the receiver. Here, both defenders are to the same side of the receiver, essentially covering the same area. Cory James does get depth and do clutter the passing lane; this forces Cam Newton to make a more difficult throw over James. There is a window to throw into, but it requires a nice throw. Cam Newton makes the throw and is just a couple of inches too high and Greg Olsen can’t come down with the catch. If Cam puts a little bit more air on it to try to make it an easier catch, it gives Karl Joseph time to close in from the front side. Even if Greg Olsen makes the catch, Joseph may have had a chance to deliver a hit. This play took a little while to develop (3.5 seconds) and that’s because Khalil Mack took an inside rush and was neutralized on the play. 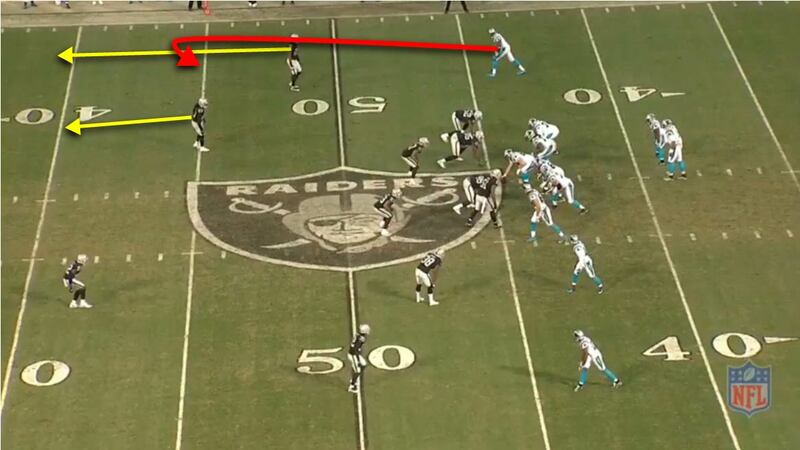 Play 6 : 4-10-OAK 44 (1:00) (Shotgun) C.Newton sacked at CAR 47 for -9 yards (K.Mack). FUMBLES (K.Mack) [K.Mack], RECOVERED by OAK-K.Mack at CAR 45. K.Mack to CAR 45 for no gain (C.Scott). Man coverage is very good. Notable mismatch is LB Malcolm Smith v WR Devin Funchess, but he has Safety help. Cory James drops in coverage and has inside bracket on Greg Olsen. 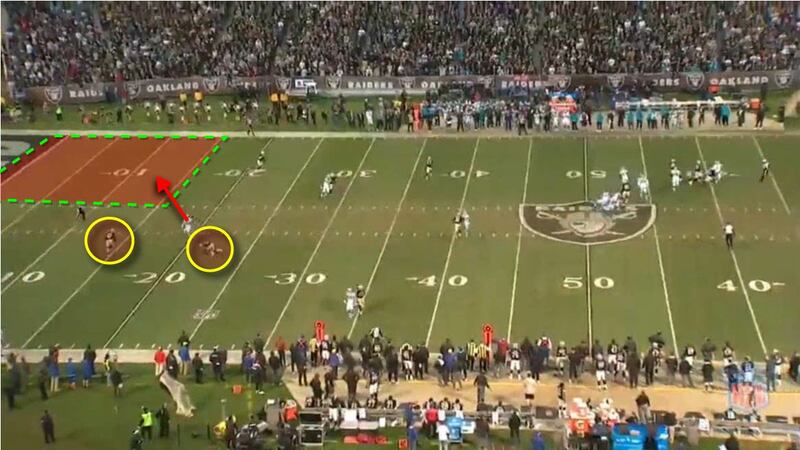 This allows Sean Smith to overplay the outside route. 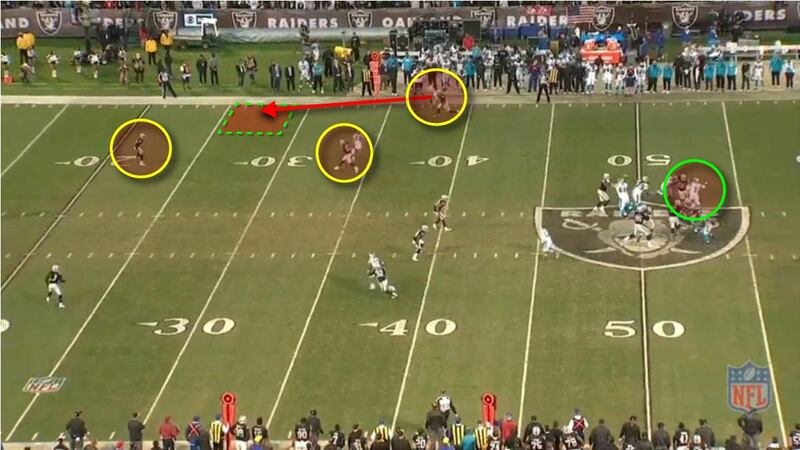 Antonio Hamilton wisely drops back to the sticks against Ted Ginn, surrendering the shallow in route. Cam Newton is lookin at Kelvin Benjamin. He wants the Jump Ball to Benjamin on the deep out, but he needs about another 0.3 to 0.5 seconds to make that throw. He also needs that time to let Antonio Hamilton clear; if Newton throws it too soon, he risks Hamilton reading it and undercutting Benjamin. Panthers get the 1-on-1 they want : 6’5″ Benjamin v 5’11” Carrie. Mack gets the sack before Newton can make the throw. Coach Jack del Rio likes to talk about “complementary football” which is when the offense, defense, and special teams each contribute to the game. In this case, we may talk about “complementary defense” where the coverage and pass rush take care of each other. In one play, the pass rush bailed out the coverage; in another case, the coverage held out long enough to let the pass rush get disruption. Ken Norton did his share also. He started off by calling two Green Dogs in a row, but with the field opened up like that, Cam Newton was able to easily throw for 30 yards and get past midfield. After that, Norton resolved to drop the LB into coverage, help on Greg Olsen, and count on the front four to get to Cam Newton. The defense wasn’t perfect, but it forced the Panthers into having to have Perfect Execution to convert and they could not do so. This team doesn’t have that in them. The Navy SEALs have a saying “The only easy day was yesterday.” And that’s so true of this team; they just look forward and know they have to continue to work hard; it doesn’t matter if they just had success or just had failure; they have to keep pounding. I credit Ken Norton Jr with instilling that attitude. It’s a competitive fire that comes from within but is trained and nurtured in practice. I also credit these players. The defense (and, again, the entire team, really) is filled with players that have redemption stories or reasons to try to prove themselves. Khalil Mack was a 3 star recruit which is why he went to University at Buffalo. Jihad Ward was “a reach.” David Amerson was a scrap-heap pickup. Denico Autry and Darius Latham were an undrafted free agents. Karl Joseph is too small. And so on. On the offensive side, when Crabtree or Seth Roberts drops a ball or if Austin Howard misses a block or if KO is called for a penalty, there’s no finger-pointing. Instead, the offense rallies around them and asks them to make up for it. Do it better next time. Same with this defense. Bad things are always going to happen and the key is how the players react. This group stays strong and brings it better next time. RaiderNation has been celebrating the late game heroics by Derek Carr and the offense. Even when they have not had a good game or when they’ve struggled in the 3rd quarter (surprisingly often this year), they come alive at the end when it matters most. As of late, the Defense has been doing this also and so we should be celebrating them for it as well. They are not great, but they have the will to be great. And right now, they are showing some signs of what they are capable of.